The weekly insight is a teaser into the opportunities – and pitfalls! – in the Asian capital jungles. Get The Moat Report Asia – a monthly in-depth presentation report of around 30-40 pages covering the business model of the company, why it has a wide moat and why the moat may continue to widen, a special section on “Inside the Leader’s Mind” to understand their thinking process in building up the business, the context – why now (certain corporate or industry events or groundbreaking news), valuations (why it can compound 2-3x in the next 5 years), potential risks and how it is part of the systematic process in the Bamboo Innovator Index of 200+ companies out of 15,000+ in the Asia ex-Japan universe. Our paid Members from North America, Europe, the Oceania and Asia include professional value investors with over $20 billion in asset under management in equities, some of the world’s biggest secretive global hedge fund giants, and savvy private individual investors who are lifelong learners in the art of value investing. “Americans love Volkswagen, and now even more,” US transportation secretary Ray LaHood enthused when he opened Volkswagen’s plant in Tennessee in May 2011, hailing the company’s efficient “clean diesel” engines as the route to long-term energy security in the US. The simple yet profound comment – “The trouble with love is that you can’t buy it” – made by Warren Buffett when students at Georgia Tech asked him about his greatest success and greatest failure, seemed particularly apt in the wake of the emissions fraud at Volkswagen which exploded last week. At least 11 million “clean diesel” VW vehicles were outfitted with sophisticated “defeat device” software designed to cheat strict emission tests for the past six years by cleverly putting a lid on emissions during testing in lab conditions, but spewed up to 40 times the legal limit of nitrogen oxide emissions, which creates smog and has been linked to increased asthma attacks and other respiratory illnesses, when not tested. The scandal has wiped more than €24bn ($26.8bn) off VW’s market value and VW faced a fine of up to $16bn in the US alone and a possible criminal investigation. Last week, we are honoured and grateful to be able to have the opportunity to share our thoughts and to have a sincere and productive conversation with the top management team at the regulatory authority in Singapore about implementing a world’s first fact-based forward-looking fraud detection framework to bring about benefits for the capital markets in Singapore and for the public and investment community. Accounting information can be used to inform – or to deceive. We believe strongly that this potential fintech platform that combines accounting data, especially footnotes, with a wide array of contextual information – including unusual related-party transactions; money-go-round off balance-sheet activities; governance, group structure and ownership analysis; textual and linguistic analysis; analysis of event-based “catalysts” (information-based manipulation) and sensitive market announcements (action-based manipulation in prices and volume) – will provide fresh insights and actionable, dynamic, inter-connected analytical information, as opposed to merely descriptive static data or a loose bag of disparate red flags, on Singapore and Asian companies, for the regulator and the public. Public disclosure of the List of companies in the highest risk decile by the five fraud categories (tunneling fraud; grand capex fraud; M&A deals potion fraud; all-in-the-family expense and liability shift; consolidation craftiness fraud) on the regulatory websites to inform and educate public (Financial Literacy 2.0) can (a) prevent harm before fraud happens, and (b) spur the potentially fraudulent firms to act to improve their corporate governance, e.g. return back part of the expropriated “missing cash”, to get themselves off the List. This will also bring about greater efficiency in the overall regulatory system given the limited resources in going after so many fraudulent cases which may occur and implode systematically during poor market and economic conditions (e.g. the reverse merger fraud wave in U.S. that was concentrated in 2011). We were recently asked a question in a light-hearted way on why does Buffett keep growing money if he “measure your success in life by how many of the people you want to have love you actually do love you”. Interestingly, we had written a positive and uplifting story back in March 2011, the year in which accounting frauds imploded systematically, from Sino-Forest to Longtop Financial Technologies, including the reverse merger fraud wave in US, and the emergence of the likes of Muddy Waters/Carson Block and Sahm Adrangi/Kerrisdale. Commerce would not have progress beyond the barter system without the invention of a system of weights and measures. Before there was the traditional Chinese steelyard (“gancheng”, 杆秤), buyers and sellers eye the heap of goods to determine their weight. It is difficult to achieve a fair trade. With the “gancheng”, the object to be weighed hangs at one end of the beam, while the weights at the other end are slided left or right until a perfect balance of the beam is found. Reading of the mark where the weight-string rests is made to determine the weight of the object. There are 16 markings on the arm of a “gancheng”, such that 16 “qian” in weight is equivalent to 1 “liang” and 16 “liang” is equivalent to 1 “jin” (or 604.79 grams). The Chinese unit of measurement was based on the number 16 instead of 10. But why 16? The wisdom behind this number will help us understand why Bamboo Innovators Sam Walton of Wal-Mart and Amazon Inc grew stronger and more resilient over time like a bamboo, why Vanguard Group is the world’s largest mutual fund manager with $1.6 trillion in assets under management. 16 is the sum of 7, 6 and 3. 7 stands for the “Beidou Seven-Star Constellation”, which symbolizes the need to have the right direction in our heart when we use the measurement tool to make money and not be too greedy. 6 stands for the directions North, South, East, West, Up, and Down, which cautions us to stay centered in our ethical principles when making money. Lastly, 3 stand for Fu (Good Fortune, 福), Lu (Prosperity, 禄), Shou (Longevity, 寿). When we make money by squeezing one “liang” improperly out of others, we lose “Fu” (损福); wrench two “liang” and we lose “Lu” (伤禄); expropriate three “liang” and we lose “Shou” (折寿). Give money back to the customers and society in a sustainable way and we gain “Fu, Lu, Shou”. Thus, the 16-unit scale is not merely a tool to measure and make money, but more importantly, it is a scale to guide and measure our values in life and in business. The late retail giant Sam Walton, whom the world’s greatest investor Warren Buffett felt was the greatest CEO of all time, saw the anomaly of retailers overcharging the customers. Sam seeks to correct things by being a champion of the customer with Wal-Mart’s “Everyday Low Prices” by passing along cost savings back to the customers to make better things ever more affordable to people of lesser means. This resulted in Wal-Mart gaining “Fu”, “Lu”, “Shou” and its astounding wide-moat compounding success to over S$200 billion in market capitalization from its initial listing size in 1970 of S$40 million. Jeff Bezos sacrificed the financial comfort and glamor of his investment banking job to establish Amazon in 1994 with the support of his wife and the life savings of $300,000 from his parents. Now, the internet retailer beats its brick-and-mortar giants at their own game by delivering goods cheaper to its customers. Surveys by Morgan Stanley and Wells Fargo found that Amazon sold a broad range of items 6 to 19 percent cheaper than Wal-Mart. By leveraging its scalable infrastructure and virtuosity in analytics in delivering a dependable and enjoyable customer experience, the customer-centric Amazon has grown bigger more quickly than any company in retail history. Wal-Mart took 27 years to hit $30 billion in sales while Amazon did it in 16 years and its market cap multiplied to nearly $80 billion. Similarly, John Bogle saw the anomaly of mutual funds charging exorbitant fees to investors for professing to beat the market, when in fact most of them lagged the market benchmark. Bogle set up Vanguard in 1974 to pioneer low-cost index mutual funds for retail investors. By passing back savings to the investors from advisory fee reductions and economics of scale, its low-expense model enables Vanguard to deliver competitive returns without chasing complex risk that they did not understand or respect. Bogle estimated that the costs of securities intermediation in the funds management industry in 2007 are $528 billion. These include sales loads, management fees, operating and marketing expenses, transaction and advisory fees, hidden turnover costs, and soft dollars, and they recur year after year at around 2.5 percent of average assets. Vanguard’s Lion Infrastructure allowed it to have around a 1 percentage point savings, which, when applied to $1.6 trillion of assets, produces savings of $16 billion annually. Commerce is not merely about the measurement of the weight of profits collected in multiple clever transactions to build abstract personal wealth. Only in the endeavour to perform first for customers, and serve them with the highest possible integrity and character, can commerce find its foundation for durable business success and create society’s abundance. The secret at Wal-Mart, Amazon and Vanguard to gaining the “Fu, Lu, Shou” (“Good Fortune, Prosperity, Longevity”) wide-moat compounding success is that the less they take, the more the customer and fund investor make. That is why enterprises designed for the public weal are the quintessential Bamboo Innovators – the bigger it is, the easier, not harder, it gets. Bogle shared a meaningful story from Reverend Fred Craddock who was known for his conversational preaching. Craddock, when visiting in the home of his niece, strikes up a conversation with an old greyhound dog. Bogle believed that the rabbit that he has been chasing in his career, which is “essentially giving investors a fair shake in their quest to accumulate assets for a secure future”, is real. It is not the illusory rabbit of success – defined by the measured wealth, fame, and power – but rather the real rabbit of meaning – defined by the immeasurable integrity and virtue. Yet, there seems to be something missing in the long hard chase for the rabbit of meaning in the asset management industry. Stage 1 is epitomized by fairness in Vanguard’s low-cost business model. Stage 2 requires a sense of caring to inspire the extra level of intensity and dedication in performing for investors. Such performance-based caring is an exacting and demanding business that requires the ablest and most dedicated navigators who truly care. Yes, the pursuit of a mission that honors society as a whole is painful and requires sacrifice, tough-mindedness and discipline. Then, rather than chasing after that rabbit, finding that it is fake, and quitting in dismay, like the greyhound, it is worthwhile to chase the real rabbit of life and business despite the pain and sacrifice, and then keep running, and running, and running, as hard as we possibly can. PS: We also like to share with you an article “Scouring Accounting Footnotes to Prevent Tunneling” which we penned for our local newspaper Business Times Singapore that was published on 19 Aug 2015: PDF article link on SMU website. 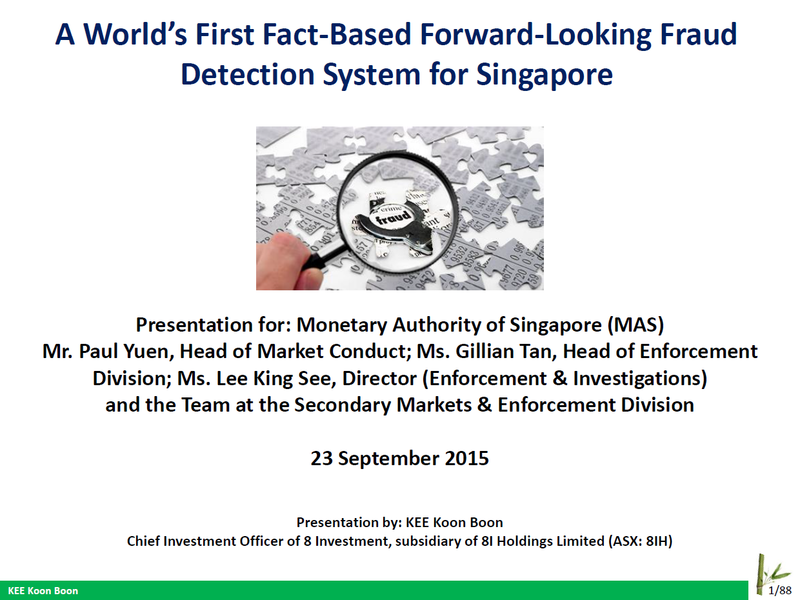 We are honoured to be able to have the opportunity to present to the top management of the regulatory authorities in Singapore about implementing the fact-based forward-looking fraud detection framework in a world’s first for Singapore. In the month of September, we investigate a listed Asian family business that has persevered for over fifty years since 1962 in this high-electricity-rates emerging country to sell something that seems risky – air-conditioners and refrigerators to consumers and commercial clients. Led by the capable, down-to-earth third generation leader Mr. C who believe in making available to his countrymen products and services that used to be affordable by only the rich as his family and personal SWFF, [Company’s name] is now the #1 market leader in air-conditioner (36.7% market share) and refrigeration (25.6% market share) which are under-penetrated appliances in the country, with household penetration rates at 6% and 35% respectively, amongst the lowest in Asia where its neighbours have at least twice the penetration rate, representing significant untapped market potential. Amongst the white good appliances that are disrupted by ecommerce, the sale of aircon and refrigerator remain resilient because they require installation and aftermarket service support. [Company’s name] provides unmatched end-to-end solutions from production to distribution to aftersales services network that spreads across the logistically-challenged country. [Company’s name] has over 90% appliance store coverage nationwide and its unrivalled aftersales service business is supported by over 170 accredited installer companies; over 130 accredited service centers; over 2,000 technicians; rapid sales facilitation and service turnaround from over 1,000 merchandisers deployed at the point of sale; and 8 dedicated parts stores; and a centralized in-house call center, distribution, parts availability/support as well as regional field personnel. Its robust logistics network ensure speedy delivery and fast service response. In terms of business nature, margins and profitability, [Company’s name] is comparable to India’s Voltas (NSI: VOLTAS), India’s #1 aircon company who is an affiliate of the Tata Group with a 20% market share. [Company’s name] has a much higher and more stable market share than Voltas and generates higher ROE at 23.1% as compared to Voltas’ 18.1%. Yet, [Company’s name] trades at a 140% valuation discount in terms of EV/EBIT and EV/EBITDA at 9x as compared with 21x for Voltas. We think [Company’s name] deserves to command a higher valuation premium for its market leadership in an under-penetrated domestic market, its strong portfolio of synergistic businesses, and its visible long run way to reinvest its profits back into the core business to extend its market leadership and widen the moat. The company has a healthy balance sheet with net cash comprising 26% of book equity due to its integrated business model that has enabled the generation of steady, resilient and growing margins, profits and cashflow and the efficient employment of capital with a 23.1% ROE.